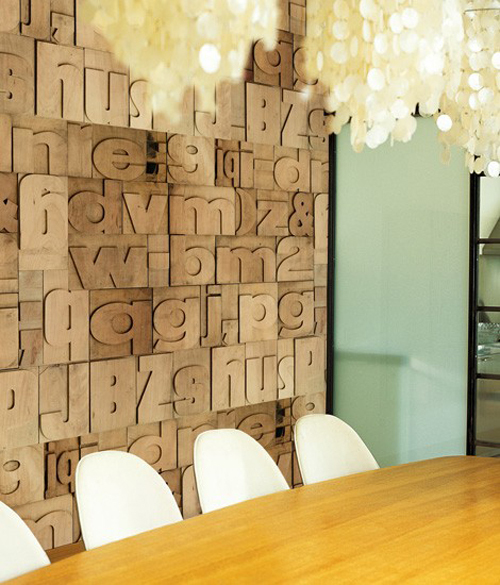 Today I’m loving … this unique typology wallpaper from Wall & Decò. This Italian company uses technical innovated materials and ideas to create original designs. The Wall & Decò wallpapers overcome the classical repetition on every roll of the same small graphic subjects, like the pattern of the common wallpapers. The unique pattern is spread all over the entire mural surface for dramatic effect. 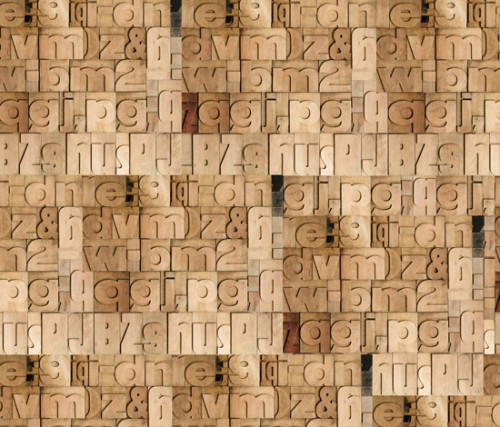 The beautiful letterpress pattern (images above) seems to be three-dimensional, an optical illusion that gives the impression that the wall consists of type blocks. Wow – that is absolutely amazing! Ah this would be really cool on a wall with an open bookcase! Beautiful! Anyone know a source for Wall & Deco in the US? Looks like they really coming out… awesome! Wow. I am ALL about this wallpaper! I absolutely love this wallpaper! Is it available in the states and if so, where?Unfortunately the Wall & Deco site is in italian and I couldn’t find this paper. That is the coolest wallpaper I’ve ever seen! Thanks for sharing. I echo the question… where can you find this in the US? did anyone figure out where to but this in the US?